So I really don't know what to say about this. I've seen my fair share of strange commercials, but this one certainly tops it. 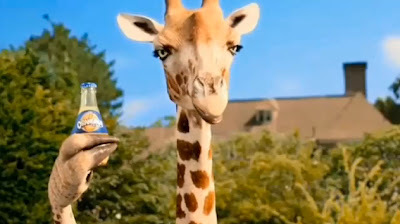 Orangina, the orange flavored drink, have come up with a campaign that features a variety animals in domestic situations. From cleaning the house to taking a shower, Oragina can literally be applied anywhere, even your arm pits. The one thing that really took me off guard was the dude at the end with the goat. This is certainly a little over the top but they certainly left a lasting impression. I can't say it was a good impression but the next time I go to the zoo, I know what I am taking with me, a glass of Orangina. Let me know what you thought, and leave me your comments below! Seriously, though, this is some strange sh*t. There are some nice ideas though, like the giraffe hanging up the laundry with the extra long collars. And I have to admit that the mountain lion using Orangina for aftershave -- and the tag showing his, um, roommate -- is pretty funny. But this wouldn't get me to buy Orangina. Indeed, if I didn't know better, I would be confused as to what exactly Orangina is. Mouthwash? Deodorant? All-purpose cleanser? This would never fly in the U.S. (puritans! ), but I think it's taste level would be questionable anywhere. Anywere, that is, where there are no talking goats.